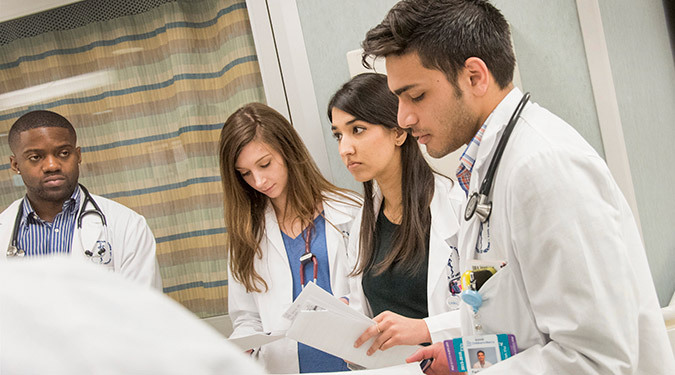 Our curriculum utilizes experiences with patients, peers and faculty in clinical settings that develop students who are passionate about medicine. Students learn the skills and attitudes for compassion, honesty and integrity which receive the same priority as scientific and technical skills. To further develop these skills and attitudes, the School of Medicine uses the following core competencies as the foundation for all educational experiences, as well as the selection of new students. Communication and interpersonal skills are crucial to a successful doctor-patient relationship. Through immediate and ongoing patient interaction, our students learn to engage with patients, families and other members of the health care team (interprofessional collaboration). Our graduates are able to establish therapeutic relationships with patients, regardless of age or cultural background, and are able to communicate in an effective manner. It is important for both medical students and graduates to observe and develop professionalism during interactions with others in clinical, academic and co-curricular activities. Students master the professional behaviors of respect, compassion, empathy, altruism, honesty and accountability. In addition, our program teaches students the value of moral reasoning and ethical judgment, to identify ethical issues in medicine, and to evaluate, recommend and defend ethical choices. Our graduates are able to recognize individual patient value systems, while integrating moral reasoning and ethical judgment in the care of patients without compromising their own ethical integrity. They learn the personal and professional development skills necessary to demonstrate healthy coping mechanisms and respond well to stress. The medical knowledge students gain during their six years of medical training allows our graduates to apply both basic and clinical science to understand, explain and solve complex, multi-system problems. Our students receive six years of outstanding clinical training that sets them apart from other medical school graduates. This in-depth training offers our students greater opportunities to evaluate problems from multiple perspectives, and to identify appropriate and rational solutions that addresses those problems. Our graduates are able to apply the knowledge, skills and concepts from all scientific perspectives to overall patient care. By acquiring practice-based learning and improvement skills, including how to access and evaluate medical information, students learn how to provide effective patient care. Students learn how to use evidence-based medicine and skills related to patient safety and continuing quality improvement, which creates graduates competent in practice-based learning. Through systems-based practice, our graduates have an increased awareness of the role diversity plays in the context of health care, and use this awareness to benefit patients and serve as better health advocates. Through innovative teaching and learning strategies, students acquire the attitudes, knowledge and skills required for patient care: data gathering methods of history-taking and the physical examination, appropriate use and interpretation of tests, identification and, in some instances, administration of needed procedures, formulation of diagnoses and companion management plans using clinical reasoning and problem-solving skills, and patient education. They learn how to care for the full range of patient problems – acute, chronic, emergent, preventative, rehabilitative – in inpatient, outpatient and continuing-care settings.